The Carrington Pub & Grill, located at the Landmark Resort, is a lively and casual place to dine. Great views from the outdoor deck in season too! Open to the public! The varied menu seems to offer something for all ages and palates. The staff is extremely friendly and prompt. And the food is tasty and creative. And the view of Green Bay waters is one of the best you will see in Door County. Let’s take a closer look at our dining experience. We came here on a Friday night, the beginning of a long Labor Day weekend. So the place was jumping. Arriving at 6:30 p.m. (a friendly hostess greeted us near the fireplace in the reception area), we did not get a table directly in front of the window. But, truly, every seat in this pub and grill has a spectacular bluff-top view of the water and woods. The Carrington is part of the Landmark Resort. It changed from a supper club kind of place to a pub and grill in 2005. You don’t have to be staying at the Landmark to enjoy the Carrington, of course. It’s a very welcoming restaurant with a large sign near the street (beaconing you in) and a building entrance, separate from the hotel. There is plenty of parking near trees on the lovely grounds. Well, this is Wisconsin. So, you betcha, a Friday Fish Fry was going on. My dinner partner chose the all-you-can-eat beer battered cod. I was tempted by the southwest tilapia . Check their menu now for current pricing and offerings. The southwest tilapia was one of 10 entrees on the menu. Entrees are served with baked potato or rice, vegetable of the day and a breadstick. I chose the rice and received broccoli with the tilapia. The food filled the plate; the breadstick was actually lying above it all. The tilapia was perfectly baked and topped with fresh Pico de Gallo. The breadstick was soft and warm like they took it right out of the oven. I liked obtaining just one breadstick, as opposed to a basket of bread in advance of a meal. My generous dinner partner shared some of the cod with me. We like the layered flavors and textures of the breading over the fish. The meal came in a basket, also filled with steak fries, coleslaw and fresh marble rye bread. The fries (also shared with me) were thick, warm and delicious. The breading added flavor and contrast, but was not overpowering to the potato. They offered complimentary refills of the diet Dr. Pepper, and the decaf coffee was OK. Our server didn’t know the brand, and, as I’m a coffee connoisseur, I was curious. Still, our server, Tia, was delightful—even though she didn’t know much about the coffee. She had a genuinely friendly greeting and came back to ask, “How’s everything tasting?” She offered to bring more of the cod, too (it’s all you can eat, remember). So we didn’t have to ask. Also on a Friday Fish Fry, you can get pan-fried whitefish or the kids fish fry, and there’s a kids’ menu, too, with more options for them). Other entrees on the contemporary American fare menu are: surf and turf, top sirloin steak, cowboy steak, beef tenderloin medallions, grilled salmon, feisty shrimp fettuccini, Malibu apple pork, chicken fettuccini alfredo and spinach artichoke chicken basket. Entrée prices range from $12.99 to $26.99, but only the cowboy steak is priced at the high end. These price quotes are to give you an idea, and you should always check their menu for the most current pricing and offerings. The sandwiches also tempt, and we came back and odered a Steak Sandwich (very good), a Landmark Stack (like a BLT - excellent), a Garden Delight Wrap (very good too), and a Taco Pizza, which was unique and delicious. The bestseller is reportedly the focaccia patty grill: Angus beef with freshly sautéed onions, Wisconsin cheddar and Swiss cheese on tomato herb focaccia bread. 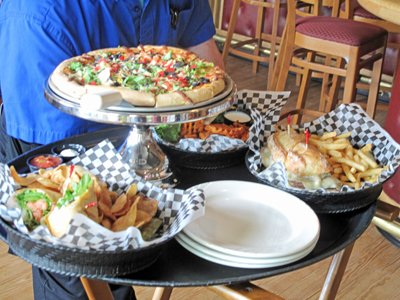 Other choices include a steak sandwich, Landmark club and chicken ranch club. Again always check for current pricing and offerings, but sandiwchs, served with fresh chips, were in the $10 (like a Buffalo Chicken Warp) to about $14.75 (for the Steak Sandwich). Entrees betwnn $14 and $22. The atmosphere is kind of a blend of nautical feel and sports bar. There are three televisions for watching the games; one is a flat screen. They were not annoying, and the volume was low. In fact, fun music was playing at just the right volume. The radio station was a local Door County favorite, the Lodge 106.9 (alternative rock and coffeehouse-style music). The bar is huge with seating all around it. And nearly everyone at the tables and chairs (as well as the big bar) has a view. We liked the size of the chairs—not too big, so you sit with your back straight and against the back of the chair. When weather permits, the new outdoor deck has got to be your choice for a seat, however. About 50 people can sit outdoors. The outdoor tables are also outfitted with umbrellas, and there are potted plants and nice landscaping all around, as well as a pleasant view. We love the outdoor deck. 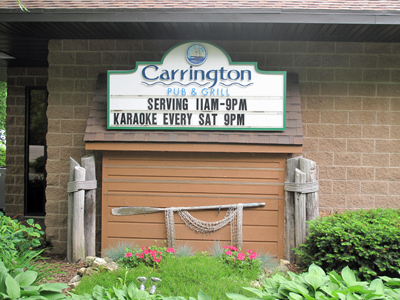 The Carrington hosts Karaoke Saturday summer nights, often has live music performances, too. See what is happening at Carrington! The Carrington also has a private room for dinner parties. Adjacent to the Carrington is the State Room, where special events are held. Just a few stairs below is the Egg Harbor Room, where the Landmark hosts large-scale events, such as wedding receptions. And always check them out for special events, like Thanksgiving dinner! And they have some winter hours too for special events! With a welcoming ambiance, pleasant staff and quality and unique menu, the Carrington deserves your dining investment. Stop by this restaurant (open year round but closed Sunday and Monday), and let them know DoorCountyNavigator.com chartered your way there - if you do, that helps keep this site alive & well!